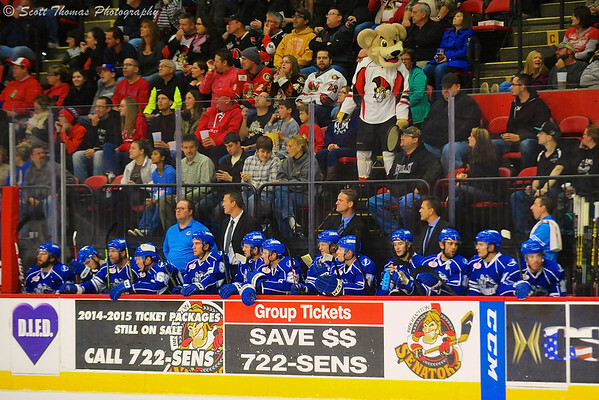 The 2014-2015 Syracuse Crunch players and coaches on the bench during a game against the Binghamton Senators in an American Hockey League (AHL) contest at the Floyd L. Maines Veterans Memorial Arena on Saturday, November 1, 2014. Nikon D700/70-200VR, 1/1600s, f/2.8, ISO 4500, EV +0.7, 150mm focal length. 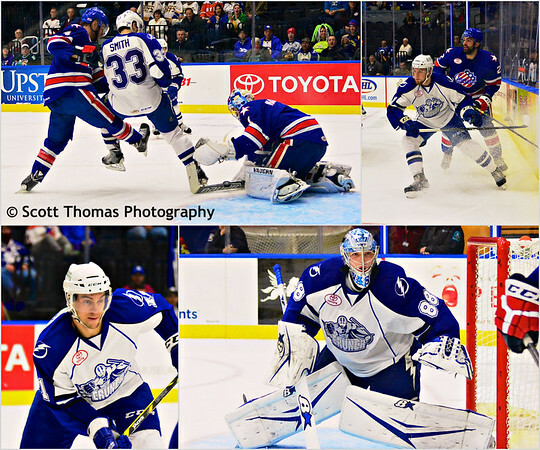 My third season photographing the Syracuse Crunch hockey team finally started this past weekend. A wedding and vacation had me missing the first four Crunch home games. It was good to get back to covering a team and a game I throughly enjoy. Syracuse Crunch game against the Rochester Americans on Friday, October 31, 2014. Friday night’s home game did not give me much action from the Crunch side of things as the Rochester Americans shut them out 3-0. In the collage above, the top two photos are of Dalton Smith (33) getting tripped while trying to score past Americans goalie Andrey Makarov (1) and Tanner Richard (71) gets the ice flying at the end boards. The bottom photos are new members of the Crunch, free-agent veteran Jerome Samson (11) and rookie goalie Andrei Vasilevskiy (88). 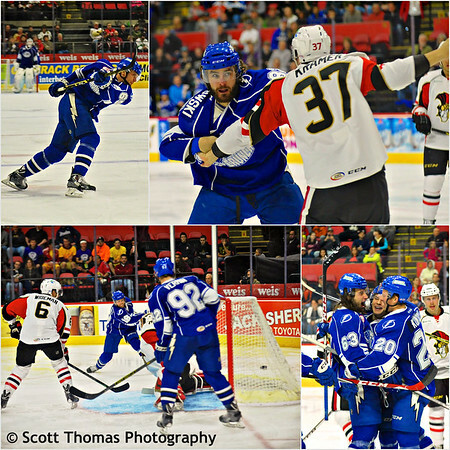 Syracuse Crunch game against the Binghamton Senators on Saturday, November 1, 2014. The next night, the Crunch traveled south on I-81 to Binghamton to play the Senators. A more spirited Crunch took the ice and ended up winning 6-3. From upper left, rookie defensemen Slater Koekkoek (65) fires in his first professional goal, Luke Witkowski (82) and Senator’s Derek Grant (57) got to know each other, Philippe Paradis (63) celebrated Cody Kunyk’s (20) goal and Jonathan Marchessault (18) sent the puck in the net to open the scoring. I have three more games before the big Frozen Dome Classic event on November 21-22, 2014. Click the link for details. This entry was posted in Sports, Weekly View and tagged 70-200mm, binghamton, crunch, ice hockey, maines arena, new york, nikon D700, oncenter, senators, syracuse, vr, war memorial. Bookmark the permalink.